Blu-ray to DVD Pro is perfect Blu-ray converting software which allows you to copy your Blu-ray movies to DVD or AVCHD with only one click. Its innovative HST™ Technology will make the Blu-ray to AVCHD conversion extremely fast, 500% faster than before. Copies encrypted Blu-ray movies with the help of a third-party Blu-Ray/HD DVD Copy Helper. Compresses a Blu-ray movie to AVCHD DVD-R/RW(s), which will bring you a better output video quality. "1:1 copy" copy mode makes perfect Blu-ray to DVD copies without any compression or quality loss. 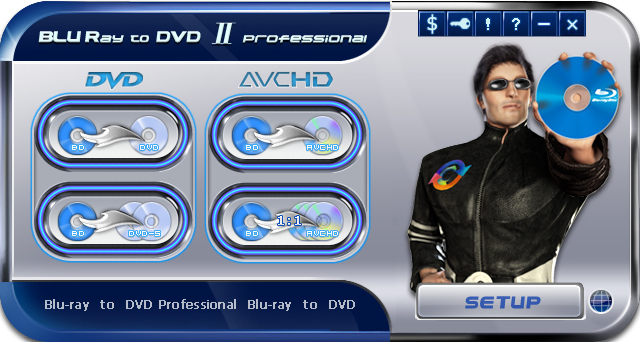 Blu-ray to DVD II Pro adopts the advanced HST Technology which will make Blu-ray to AVCHD conversion 500% faster. The SmartExpress HD video codec module ensures an effective burn. A freeware to protect the sensitive files, prevent your protected files being read,written,deleted, renamed, copied out of the protected folder, allow you to authorize or deny the file access to specific user or process, secure file sharing. Xilisoft DVD Copy Express is a stable, fast, and easy-to-use dvd copy software and dvd burner with excellent DVD copy quality. It can entirely copy dvd movie in 1:1 ratio perfectly, compress DVD-9(dual-layer DVD) to one DVD-5 disc easily. Emicsoft MKV Converter for Mac is a professional and outstanding Mac software which is specially designed for Mac users to convert MKV to MPEG-4, AVI, DivX, XviD, FLV, WMV, 3GP, MOV, HD video and MP3, WMA, WAV, AAC, AC3, etc. Burnova is the professional DVD/Blu-ray burner, which creates local videos from computer or downloads and makes online movies from YouTube, Vimeo, etc. to DVD or Blu-ray disc/ISO/folder. It is easy and quick to realize ripping DVD to mp4 mac with this powerful Emicsoft DVD to MP4 Converter for Mac, excellent output quality and fast conversion speed.